My goal is to create the perfect Bitcoin Lightning node, running on unfairly cheap hardware, set up completely trustless from scratch. This guide brings you what I think is a near perfect solution. Running our own nodes is important, both to learn more about this amazing technology, and also keep the network decentralized by not trusting any third party. Being able to do that on cheap hardware is important. This is why I published the Beginner’s Guide to Lightning on a Raspberry Pi (my RaspiBolt) which created a lot of positive feedback. The Pi is available everywhere and has a huge community. It has some drawbacks, however, mainly in the area of performance and the the hassle with attaching external storage that is important when storing the whole Bitcoin blockchain. One feedback sparked my interest to consider the Odroid HC2 mini-computer. Not available are features like HDMI output, built-in Wifi or GPIO pins, all of which are not relevant to this project, however. Performance is way better and production is guaranteed until at least 2020 (and longer, if parts are available), thus it seems more future-proof. 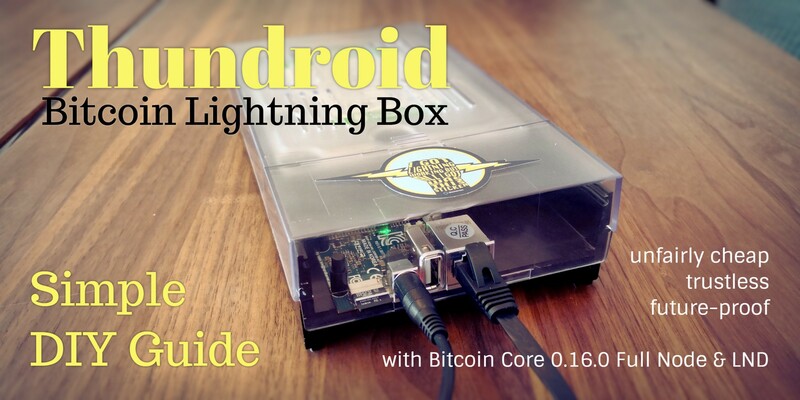 I decided to try this setup, ordered the Odroid HC2 and, after setting it up and running it for a month now, I think this is as good as it gets for a low-cost Bitcoin / Lightning node. This is why I am going to describe the setup of a Bitcoin Core full node with a LND lightning node here, in case you might want to try this as well. My aim is to set up a trustless Bitcoin Core and Lightning node that runs 24/7, is part of and supports the decentralization of the Lightning network by routing payments and can be used to send and receive personal payments using the command line interface. This server is set up without graphical user interface and is used remotely using the Secure Shell (SSH) command line. In the future, this server should function as my personal backend for desktop and mobile wallets, I’m not quite there yet. So, command line it is for the moment. Things on my bucket & todo list: web interface, desktop und mobile wallet. Please note that only the setup for Lightning on Bitcoin testnet is described at the moment. Once a well-tested mainnet release of Lightning is available, I will update this guide and provide update instructions. This will not be a beginner’s guide, but the setup is comparable to the RaspiBolt guide, so you can easily get more detailed explanations from there. The goal is to do everything ourselves, no shortcuts that involve trust in a 3rd party allowed. This makes this guide quite technical, but I try to make it as straightforward as possible. Also, please be aware that all Lightning implementations are still in alpha phase and bugs are to be expected. If you like to learn about Linux, Bitcoin and Lightning, this guide is for you. I ordered the following items directly with Hardkernel in Singapore. There are resellers available worldwide, but not for Switzerland, unfortunately. This guide is configured to use the Bitcoin testnet. You can easily download and verify the blockchain using the Odroid HC2. However, for a switch to Bitcoin mainnet, will will need to initially download and verify the Bitcoin blockchain on a regular computer (only once, not regularly). use an additional external hard disk to transfer the data via USB. We are going to format the internal hard disk using the Ext4 file system, which is not compatible with windows. If you want to connect the hard disk later to a windows computer, you need additional software (free for once-time-usage). Assembly is easy, just enter the hard disk and fix it with the the screws included with your Odroid. If you ordered the plastic case, just slide it over the metal body. Create strong passwords for the following users and interfaces. As this is not a Pi, I will use the user “admin” instead of “pi” in the original guide. We use Ubuntu 16.04.03 LTE (Minimal, Bare OS) that is provided by Hardkernel. Download the image, flash it on your MicroSD card, put it into your Thundroid, connect it to your network via cable and connect the power adapter. The initial boot can take several minutes. SSH is on by default. Give your Thundroid a fixed IP address in the DCHP settings of your router. See section (4) of the RaspiBolt guide for additional information. When you enter commands, you can use the “Tab” key for autocompletion, eg. for commands, directories or filenames. If you are using Windows, I recommend to use the SSH client KiTTY. You can copy text from the shell by selecting it with your mouse (no need to click anything), and paste stuff with a right-click. When using the Nano text editor, you can use the same keyboard shortcuts to save (Ctrl-O, confirm or change filename & press enter) and exit (Ctrl-X). Your Thundroid will handle money and needs to be super-secure. Login as “admin” (we will not use “root” again). Fail2ban monitors SSH login attempts and bans a remote peer after 5 unsuccessful tries for 10 minutes. The firewall denies all connection attempts from other peers by default and allows only specific ports to be used. The line ufw allow from 192.168.0.0/24 … below assumes that the IP address of your Pi is something like 192.168.0.?? ?, the ??? being any number from 0 to 255. If your IP address is 12.34.56.78, you must adapt this line to ufw allow from 12.34.56. **0**/24 …. 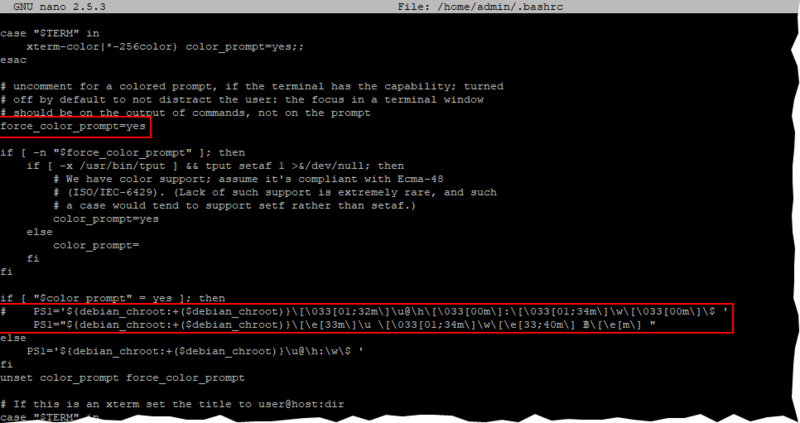 # change session to "root"
# exit "root" session back to "admin"
If you can log in as “admin” with your SSH key (check! ), we disable the password login. You can now only login with “admin” or “root” and your SSH key. As you cannot connect a screen to the Odroid, SSH is your only option. ⚠️ Backup your SSH key! There is no fallback login! Worst case scenario: you need to flash the MicroSD card and set up the system again, all important stuff is still on the harddrive. You can make your node accessible through the Tor network. Please check your configuration carefully and also check the original article of Damian Mee for additional details. You can prettify your command prompt for each user by enabling color output and setting a custom prompt. Use either the yellow or red user, not both. I use the red prompt for user “admin”, and the yellow prompt for “bitcoin”. # edit .bashrc with user "admin", use options from below. Installing the Bitcoin Core software connects our node to the Bitcoin network, and allows us to use it also as a trustless Full Node. Install it the speedy way with the following run-through, or check the RaspiBolt guide chapter (7) for more details (just use the user “admin” instead of “pi”). # output: "Good signature from Wladimir ..."
# back to user "admin"
Optional: if you installed Tor, check if it is recognized by bitcoind. At this time, no wallet needs to be created, as LND does not require the Bitcoin Core wallet. We will compile and install the LND Lightning node. Other Lighting nodes like Eclair or c-lightning can also be installed, even simultaneously. However, only one should run at any given time. To announce our public IP address to the Lightning network, we need to get it first from a source outside our network. As user “admin”, create the following script that checks the IP all 5 minutes and stores it locally. As user “admin”, we first need to install Go compiler, clone the LND source code, compile and install it. ⚠️ The following code box is outdated. Until I fix it, please follow the official instructions in the LND repository. # session with user "bitcoin"
# exit user session back to user "admin"
LND logfile: Waiting for wallet encryption password. Use `lncli create` to create wallet, or `lncli unlock` to unlock already created wallet. For security reasons, only user “bitcoin” can interact with bitcoind and lnd. Now, get some tBTC from a Faucet, eg. https://testnet.coinfaucet.eu and send them to this new address. As we enabled the “autopilot” feature, LND will automatically open channels. Get yourself a payment request on StarBlocks or Y’alls and move some coins! To get a quick overview over the system status, I created a shell script that is shown on login or on demand. This script will run as root, so please check it before blindly trusting me. You can now start the script with thundroid and it is shown every time you log in to your Thundroid. The Odroid HC2 manufacturer recommends to apply the following script to park the hard drive for a safe shutdown. # In all cases, we want the media to be in quiescent, clean state. Let me know what you think. And if you actually did set up a node with this guide, I’d love to hear from you! Please post questions, suggestions and adulation in this Reddit post.